I’m not going to subject you to the file of unfocused photographs I managed to take with my new pocket camera over at the weekend – some of them might amuse us but in the end they’ll make me cry. Sometimes … 🙂 Thanks Ella! Fabulous indeed! Glad you decided to share these! Me too, really. I’ve been trying to be more decisive on my first choice, but it seems I can’t, so I get to share a couple of favs:) Glad you liked them too Madhu. I’m so glad you shared these – they are magical. If it takes lack of focus to make images like these, then I’m all for it! I love the reflections of light on water, the shades of gold in the first shot. when I first loaded it onto the computer I was devastated (of course) that it wasn’t in focus, but it wasn’t long before those gorgeous golden ripples and reflections won me over. Now I wouldn’t have it any other way! Just lovely. These pictures make me think of magical things; sparkles, shooting stars, glitter. Thank you for sharing them, Mere. Ah, I see. 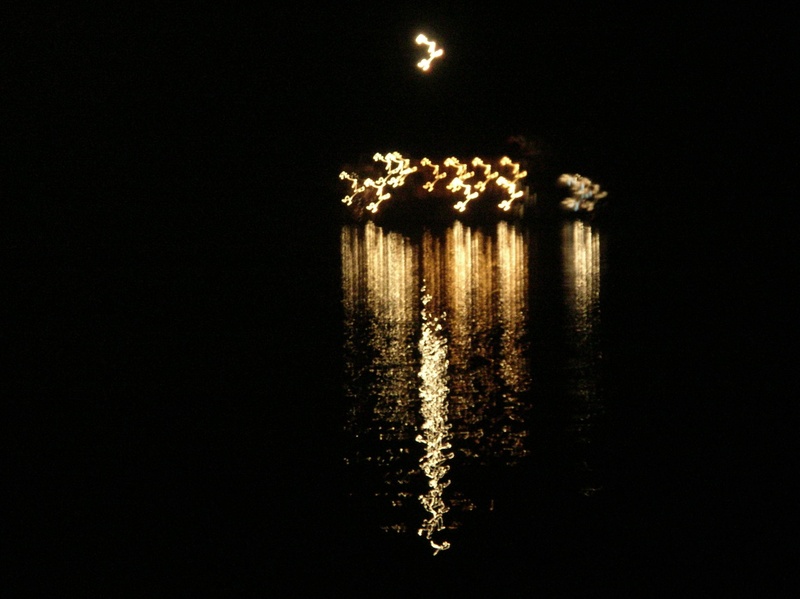 The lights on the water are dramatic and lovely. What a wonderful surprise! I think real photographers find beauty and interest in whatever catches their fancy. You turned a muffler grave into a place of textural beauty. Brava! Coming from a self proclaimed master I don’t know how you take this: They’re both beautiful and don’t look unfocussed at all, I love them! By the way, I’ll answer your Bougainvillea question and gather together the links you’ll need to stop the email influx. But right not, you can stop making future problems for yourself by adopting a new protocol when you’re making a comment on anyone’s blog. There is now a little blue tick in one of the boxes immediately below the comment box you type in. YOU MUST DISABLE IT before you post your comment! thanks for the tip, shall follow the rule! also when wp reports 500 spam and 65 ham is their filter actually doing its job accurately? Getting warmer! Come on, now- nobody has an empty Inbox! Jo, dear – that was written back in May – the weekend we had the comments meltdown. i got back from a few days away to a bursting inbox of over 500 emails!